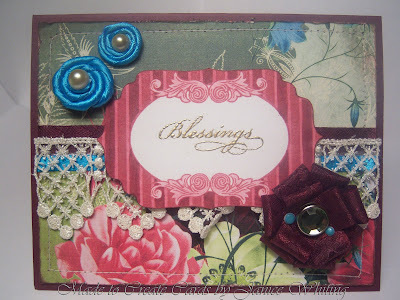 Here is a card I made for Stampin' Sisters in Christ Challenge #40 (make a card incorporating inking for a distressed look) and for StampTV's color challenge (burgundy, gold, and white). This card is also on it's way to the super sweet Jennie Harper! There is a Send a Card, Receive a Card thread over on StampTV and I got the honor of sending a card to Jennie! :) Go check out her blog if you love to get inspired by some beautiful creations! Oh my goodness is this every pretty! I love the papers and gorgeous colors you used!!! I can't take my eyes off this beauty! Thanks for joining us at Stampin Sisters in Christ!!! Very pretty, did you roll and make those flowers yourself? Great color i this piece. Thanks for participating in this week's Stampin' Sisters in Christ challenge. This is so pretty!! I just love your colors and those stunning flowers!! Thanks for joining the Stampin Sisters in Christ challenge this week.